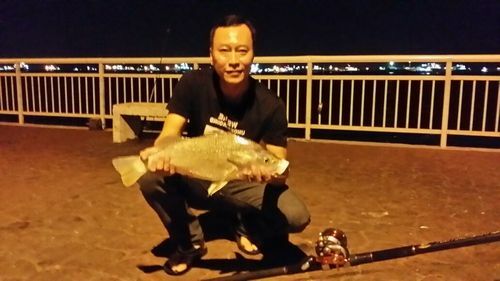 Ah Joe hard work paid off….He first caught the 2.8kg Baramundi on a handline below the jetty. The fish took his live squid bait and run off below the jetty. Joe was fast enough to pull it out in time before the fish entangle with the jetty pillar. I used my squid net to scoop it up. Before he settle down on the catch, his reel alarm sounded. He pick and strike….yes fish on….The fish gave him some fight before he gain control. Winding in was a nice n rare 2.6kg Gerut. I gaff it up. Hookup this flat head when the tide start turning up. It took the bait n swallow deep. I only notice when I change bait. 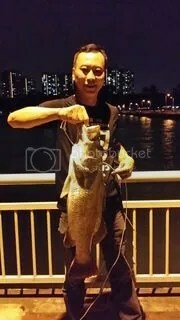 It is the third fish I caught within continue three night. 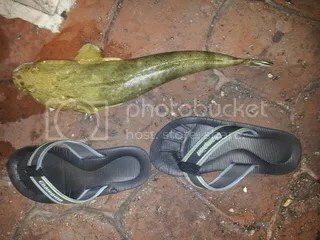 Its around 500g and is a good size for this type of fishes. Tide was on the way up. Current flow is very smooth. My torium reel scream when I was busy with my squid lamp. I strike and the fish make a acrobatic jump on the water surface. As it is not big, i easily bring it in. Ah Hong use my squid net to scoop it up. Its a giant herring about 1.5kg in weight. It was near to midnite. Tide was about to full. Current already change direction as the downtide is stronger. I already starting packing up when suddenly my reel screech. I strike…..yes fish on…It fought back for awhile before i gain line. As the current is not strong, easily I bring it in. Joe help me to lift it up by grabing my leader line. Its about 3-4kg in weight.